Hazardous waste is waste in a solid or liquid state, or a combination, which displays one or more of the hazardous properties listed in the Second Schedule of the Waste Management Acts 1996-2013. There are a total of 15 properties of waste which render it hazardous. 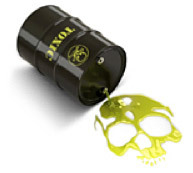 Hazardous waste requires specialist handling so that it does not pose a substantial present or potential hazard to human health or the environment when improperly treated, stored, transported, or disposed of.